The deed is done, I finally folded, sorted and packed up all the fabric from my reorg. I ended up with 8 bins. 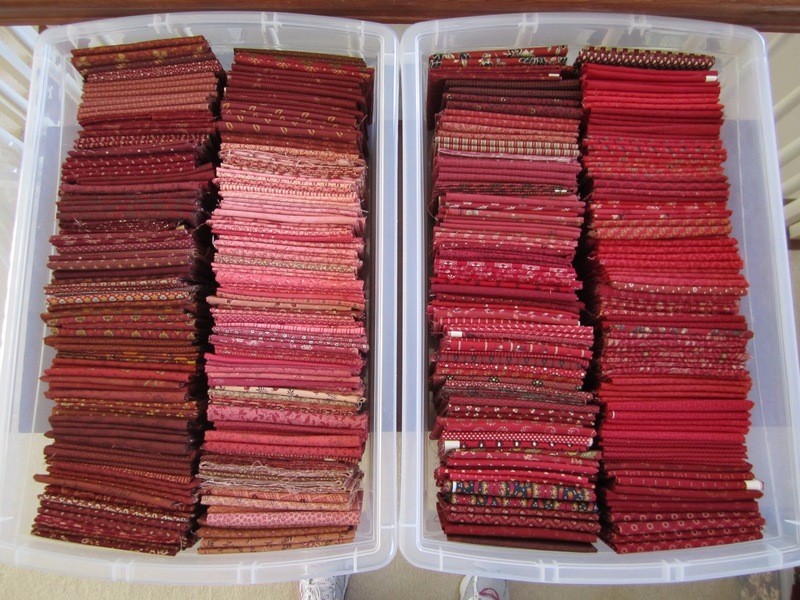 I could easily condense the fabric into 6 bins, but I like how everything is sorted by color in each bin, and having room in each bin makes it easier to look at the fabric, pull it out, and put it back. (putting it back being the most important reason for leaving space) If I pressed the fabric together, there is this amount or more space available in each bin. I DID NOT leave the extra space for new fabric, really! a bin of blacks, grays, and purples, and a bin of blues. Every time I blog about my reorg I always get a few questions about why I'm going with a fat quarter system. I'm no expert, and I don't really know if this is the best way to go for me, let alone you, but having the majority of my fabric in bins, sorted by color appeals to me. Now I only have to go to one place when I want to look for fabric, instead of looking through my yardage stack, my scrap bin, and my fat quarter bins. Before I started this reorg my fat quarter bins were sorted by family, by kit, and sometimes by color, not nearly as organized as they are now, so even getting the bins out wasn't easy. On a personal preference level, I just like working with fat quarters. They are easy to press, cut and I've never needed a piece larger than a fat quarter to make a block. I had some 1 yard and 1/2 yard cuts that I could have folded and put in the bins, but I cut them into fat quarters and kept them together in the bins. I'll let you know how it goes as I start to pull fabric for projects. Like I mentioned earlier, those bins make up the majority of my stash, the fabric in the bins is traditional fabric or civil war reproduction fabric. Additionally, I probably have 8 kits. I also have a small stack of red yardage, a drawer with my French General fabric, a container of precuts, and this container, which I call my happy fabric. I guess it's more modern than happy, but the colors are bright and my definition of happy. It's basically some Carrie Nelson fabric, Kate Spain fabric, and Bonnie and Camille fabric. Not a very diverse group. So that's my stash and while I am happy to have it all organized, I have to admit I wonder how I got a stash made up of this fabric. I don't even remember buying the fabric in the bins, I certainly didn't buy fat quarters to specifically put in those bins. A lot of times I would buy a kit then supplement it with additional fabric to make it even more scrappier. A lot of the fabric in the bins are the kit leftovers or fat quarters I didn't like and didn't use. And I bought a couple of Barbara Brackman fat quarter bundles and Jo Morton fat quarter bundles that I filed in those bins. I'm amazed by the folks who are able to actually buy for their stash, other than reds I don't think I've ever just bought fabric to have, I normally have a purpose for it. Although if I had a purpose for that fabric I wonder how I ended up with 8 bins of it! One problem I have is that I can't decide what type of quilter I want to be. I love traditional quilts and some of the modern quilts. 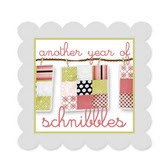 On my Favorite Blogs list I have a link to Hyacinth Quilt Designs. Even though Cindy is a modern quilter, I love everything she makes, but what I admire even more is that she knows what she likes and that is what makes up her stash. Here is a link to her post where she talks about building a stash. click here This got me to thinking, I don't really work at building a stash, for someone as organized as I am, and into planning every detail, I just sort of let my stash build itself. So while I have more than enough traditional fabric, I'm really lacking on my modern side. Since I don't have much in that area, maybe I'll focus on trying to build that stash using the tips from Cindy and Allison. I'm really short on plaids, stripes and dots. In my defense, I don't have access to local quilt shop, I have to drive around 60 minutes to get to a good shop. Maybe I would have a more diverse stash if I was able to pick and choose fat quarters from some the the latest lines, instead of just getting a whole bundle. I sure envy you ladies who can pop into a quilt shop every week. So I am happy to have this space back and to have my fabric organized, but I think I've really just started the process of "building" a stash. Exciting news, the temperature jumped 40 degrees over the weekend and my day lilies have started peeking out of the ground. I'm now hoping we actually get a spring and don't go from Winter to Summer! Some folks are just never happy with the weather! I love your neat & tidy stash! You definitely have a fine selection of neutrals & reds which is just what I would expect. I can't remember if you did a post on folding your FQs but I will go and have a look as yours are so very neat. Happy sewing! I love love your stash. Love all the exciting choices you have to pick from to make a project. You have a nice variety of fabrics to choose from. I don't really have a stash but hope to some day. I think fat quarters would be a great way to go. Thanks for showing your system and letting me dream on this Monday morning. So many interesting things to think about in this post. I am reflecting on how my stash developed, what I like about it and what needs to change. That will be my project for May and June I think. Thanks for the mention, Thelma! I do love my stash :) and the challenge of mixing up different lines. And I know what I like - but it's taken me some time to get there. Organizing what you have is the first step. Then you can think about what you use and what ends up sitting on the shelf (or in the bin). Great job! Great info Thelma and really gives one something to think on....would I be better this way???? Perhaps it would be less wasteful than big chunks of fabric. Your bins look so nice and great way to see where everything is. Glad you finally have spring growth outside....Nice! 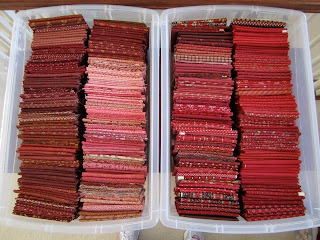 Well, Thelma, your stash looks fabulous and I think that a lot of quilters would focus on how pretty your stash looks...but I look at it and recognize the mental clarity and relief that your organizing has probably given you. You're a great inspiration, that's for sure! Have a great day. Thelma, what do you do about fabric for borders that require larger amounts or for backings? Do you have a separate stash for these needs? 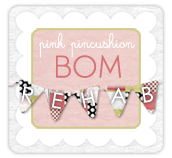 I've loved watching you and Patti (over at My Current Obsessions) organize your stashes! I admit that I usually "stash" by project. It would be hard for me to just buy fabric in general because quite frankly I can see a potential use for just about every piece of fabric in any store or website that I go to! Doing it by project or kit sets limits and then, like you said, I can fill in with extras to make it more scrappy or personal. But I've got to say collected stashes like yours are drool-worthy! I also stash the leftovers from projects so maybe if I can get more of my accumulated projects done, I WILL be looking at a nice general stash down the road. Gee, can you come and organize mine now? Like you, I quit buying fabric that didn't have a purpose. I ended up with way too many orphans that I had no use for. Watch the weather. Today we're going to be at a high of 72 with partly cloudy skies. Tomorrow a high of 23 degrees with 12" of snow and east of of will have a blizzard with 60 mph winds. Aaaahhh, springtime in the Rockies! wow! your room looks amazing. congrats on getting it done so fast. now can you help me lol. love your work. I think the best thing about having an organized "collection" is that it lets you see what you like - it's usually what you've got the most of - and what you're missing. (Purple - you need some purples.) It also lets you see if your tastes are changing... like when something has been in the collection for years and years. You like it but you don't use it. Your stash looks amazing! Congratulations on all your hard work! and I thought I had a lot of fabric. I need to do some organizing yours looks so pretty. I am in the process of rebuilding my stash. I have been breaking down my bundles and sorting fabrics by colors. I need to break out of the "one liner" thing and just look at the colors, prints, and values. And I'm with you on the putting fabric back and maintaining enough room to add and subtract. Nothing more frustrating than a stash that is so tightly packed you can't get to anything without disrupting the whole bin! I love looking at others stashes. Everyones is different. My whole stash is bright and happy. I don't own any civil war fabrics that I am aware of, just the total opposite of your stash. I would be afraid to go into your room and start to sew, it is so neat clean and tidy. I just cleared off two table in my sewing room, putting eveything back where it belongs. Now it isn't 100% cleared, at least I can see the top and get started sewing again. Thanks for sharing your stash. I am impressed with your organizational skills Thelma. I am even more impressed with your stash! I wonder what mine would look like if I did some sorting and folding. Hmmm. I am pretty sure I have a spring/summer stash and a fall/winter stash. I love Cindy's blog too. Hi Thelma! This was a great post - I love seeing how other people organize their stash. Your comments about figuring out what kind of quilter you are really struck me. I don't fit into any "category" as a quilter. I like everything - traditional, modern, appliqué, landscapes. If it's a quilt, I like it. I guess that's why I chose the Adirondack Urban blog name. Like the old Donny and Marie song, I'm a little bit country and a little bit rock and roll. I don't remember on which blog I read it recently, but the question asked was if you forget about trying to match your decor, what kind of quilt would you make? I think Mary Fons probably puts it best. She says to make the quilt you want to make! So my advice is to not worry about figuring out what kind of quilter you are and make the quilts you want to make. Your neatly folded fabrics in the bins remind me of a booth at a quilt show before all the customers arrive. Very nicely done. Great timing, finishing the fabric organization just as the weather is warming up! I am still working on finding out what kind of quilter I am. I don't know the answer yet but the journey is fun. Thanks for sharing. Your stash looks awesome and you will be so productive with it all organized. we got more snow last night yuck. I am so tired of wearing winter coats and gloves! I use bins also, but different sizes of fabs, squeezed down and folded to about the same sizes..Good enuf I figure. What I want to comment on is that u said u don't know "what type of quilter" u are. Im not sure if it really matters what "type" we are cause I really don't know any quilters who are just one type. Ususally quiltmakers may be ONE type, with a spillover of a few other "types". Now I dont decorate our home in the modern prints, but I sure do love working on quilts for others with them! Loved seeing the pics of those gorgeous bins...I have been thinking about making a two color scrappy quilt and your scrappy bins are such inspiration to look at! I love seeing other quilter's stash and reading about what works for them! With bits of inspiration from here and there I'm working out the best system for me. Sometimes it takes several attempts but I'm getting there and it's well worth the effort! Thanks for sharing. It is time for me to reorganize my sewing space and you have given me much inspiration for how to sort and store fabric. The fat quarters fit so perfectly in you bins. If you don't mind me asking, what size did you use? Totally inspired! I was wondering... since I am doing the same thing, do you mind if I reference you on my blog? I'll just make the link clickable to your page here. I know quilters are always looking for the "best" way to keep a stash organized so it is easy to use and your way is very good..not to mention a great way to see all the color! Let me know!